TIMERGARA: The former Dir State employees inhabiting parts of Jandol demanded of the district administration to stop demolishing their under-construction houses and other structures. The demand was made in a meeting at Sadbar Kalay. The ex-state employees’ leaders from different villages attended the meeting. 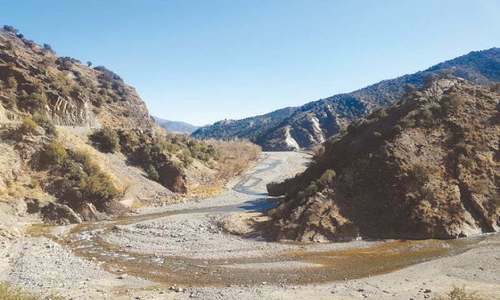 They said the ex-state employees had possessed the lands in Jandol for 150 years allotted to them by the Nawab of Dir Shah Jehan Khan in return of their services for the state. They said the government too had made an agreement with them in 1974 that they would be provided with a piece of land for construction of house, Rs3,000 cash and a rifle as a reward for vacating the state land. But, they said the agreement was yet to be implemented. They demanded of the government either to allot the lands to ex-state employees or pay its compensation as per the agreement. They said the administration had banned construction on the land, causing them difficulties, and demanded its lifting. ROBBERY INCIDENTS: Taking notice of growing incidents of robberies in residential areas, assistant commissioner, Jandol, Mohammad Ayaz Khan has asked police to take practical measures to curb the menace. He was chairing a meeting of political activists, police officers from Munda and Samarbagh tehsils, representatives of traders’ body and local government the other day. The elders expressed concern over nighttime house robberies in Samarbagh and Munda tehsils, but lamented that the police were unmoved. The assistant commissioner reprimanded the relevant police officers and directed them to take practical steps for busting the gang involved in the robbery incidents. He said if police failed to deliver their progress report would be sent to high ups for disciplinary action. The locals also demanded steps against fireworks at night, curbing growing number of stray dogs and establishment of bus stands in different bazaars. AC Ayaz Khan said Dir Levis officials along with police would patrol the streets at night in order to maintain law and order.